Bathroom vanities can make or break the design of your bathroom. 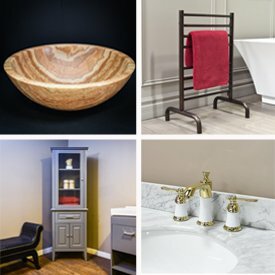 At Luxury Living Direct, we provide one of the largest selections of high end vanities from the highest quality manufacturers. Find a large assortment of vanities with tops and bathroom vanity sets at wholesale prices with free shipping. There are many different bathroom vanity styles. Find both traditional and modern vanities to fit your decor. Rustic bathroom vanities are popular among those who want a more traditional style. There are many different types of modern bathroom vanities including wall-mounted or floating vanities, freestanding vanities and vanities without tops. Vanities without tops allow you to be able to customize the countertop, sink and faucet to your liking if you can’t find a vanity set that you like. For modern vanities, you will find beautiful floating bathroom vanities. These wall-mounted vanities are held together by wall-mounts that give a floating effect. These are great for those who need non standard height. Freestanding bathroom vanities are more traditional and transitional. They usually sit flush on the flooring or held up by toe kicks. There are many different freestanding vanities in our collection which include cottage or farmhouse styles. Our selection carries a wide range of different sizes of bathroom vanity widths to fit virtually any bathroom, small or large from brands like Virtu USA. For smaller bathrooms, you will be limited to single vanities. If you are looking for a double vanity, you are probably looking for a medium to larger vanity that is 60 inches or wider. Unlike single sink vanities, double sink vanities are not limited to only having two sinks. If you need a large width with only one sink, most larger widths can still accommodate. Other types of vanity remodel ideas are corner vanities and mirrored vanities. Choosing the right type of bathroom sink can make a huge difference in the look and design of your bathroom vanity. The difference between undermount sinks is the countertop lays on top of the sink and drop-in sinks will lay on top of the countertop. Vessel sinks are sinks or basins that sit on top of the countertop. There are many different styles and designs depending on the homeowner’s preferences. With our custom vanities program, you can customize and swap components on bathroom cabinets for your bathroom decor.